The Laws of Justice is published amidst a chaotic period in history where there are an unprecedented number of world conflicts including international terrorism, the rise of ISIS, the Syrian Civil War and tragic refugee crisis, the Iranian Nuclear deal, the military expansion of China, and nuclear development and threats by North Korea. During the eight years of the Obama Administration, the world order has begun to fluctuate greatly as the American government has abdicated its role as the world’s policeman. The volatile nature of the 2016 American election may further complicate the international business, economic, and diplomatic climate including critical international trade. 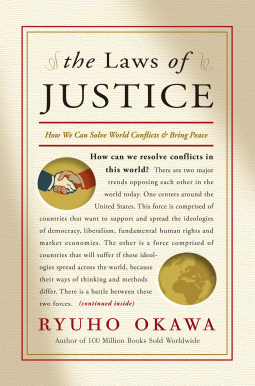 By combining six of the author’s lectures given in Japan, The Laws of Justice has brought together religious, spiritual, political, and economic reasoning to show how world leaders, academic thinkers, and thoughtful readers can bring the world together. This ultimate guide to world peace depicts how justice should be in this world from a unique perspective that surpasses differences between religion, race, and culture. - Book promotion on TV: Fox 5 in Tristate area for 8 weeks in AUG/SEP. - National Radio Advertising Campaign focusing on leading conservative nationally syndicated talk shows. - Talk Radio mostly conservative interviews to promote book. Also, giveaways to both 100 top talk show hosts and to listeners. - Magazine/Newspaper and Wire service review and features. Also targeted mailing to conservative columnists of city newspapers. - PR Newswire releases targeting 5,000 of the most signifi cant national and international print, broadcast and online media. - National Print Newspaper and Magazine Advertising Campaign including New York Times, Foreign Affairs, and PW. - Mailing to infl uential Republican political leaders including the two presidential campaigns, Think Tanks and government committees as well as Asia experts in education. - National Online Advertising on leading Political Sites and Social Media. - Online news sites in both politics and religion books sent for review or interview. - Social Media publicity through IRH Think Tank, and other Facebook and Twitter feeds. - Book Seminars at Happy Science temples in NY, NJ, LA, SF and Atlanta. - Happy Science US Ministers in NY, NJ, LA, SF, Atlanta and Tampa interviewing with local media. - Op-Ed placement from US spokespeople on book topics.